Late night hosts have poked fun (to put it lightly) at Sean Spicer for months, but it seems he's ready to make amends. The former Press Secretary is slated to appear on "Jimmy Kimmel Live" on Sept. 13, and Spicer has already struck up a Twitter camraderie with the funnyman. Kimmel posted an undated throwback photo of the two together, possibly from a past appearance at a military event. Spicer is in his Navy Reserves uniform while Kimmel wears a US Navy baseball cap. 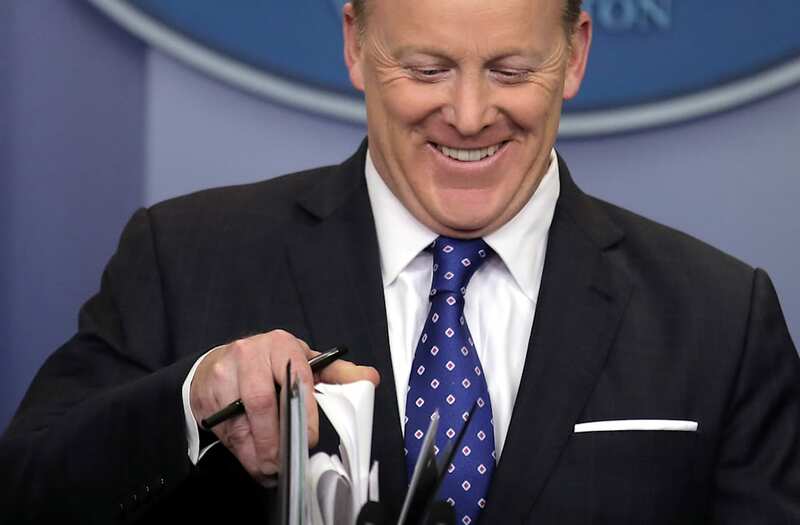 "Dear @SeanSpicer - if I promise to look AT the camera this time, will you come to my show next week?" Kimmel tweeted. Spicer responded just minutes later: "It's a deal, does next Wednesday work?" "Perfect!" Kimmel replied. "I have no further comment." Perfect! I have no further comment. The appearance will mark Spicer's first interview since resigning from his White House position in July.